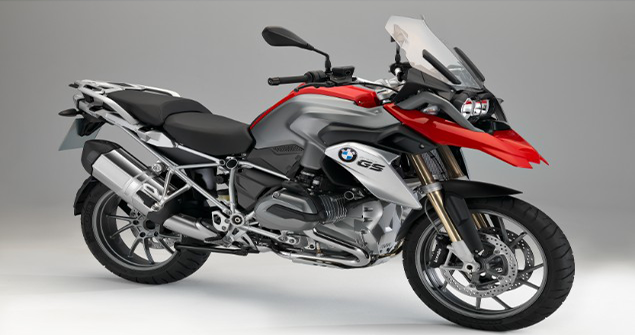 We’ve all got a pretty good idea of the best NEW adventure bikes currently on the market – BMW’s R1200GS and BMW R1200GS-A duo remain UK best sellers. 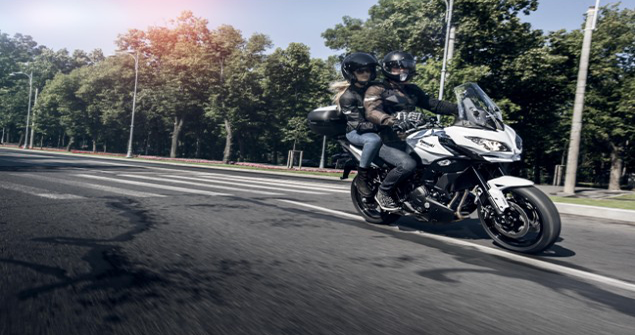 Triumph’s recently updated Tiger 800, now available in six different guises, is undoubtedly one of the most versatile bikes out there. And the likes of KTM and Ducati continue to dazzle with their enormously sophisticated and hugely impressive big V-twins. But what are the best USED options available? Or is it simply a case of buying the best and most recent version of those best-sellers that you can afford? In short, as we discovered, the answer is yes – and no. So to help, here’s our pick of the very best secondhand adventure bikes on the market, to appeal to all budgets and abilities, and in ascending price order. The term ‘adventure bike’ with all the images of scale and bulk that conjures combined with the novice-friendly 125cc learner category don’t normally sit comfortably together. But, Honda’s brilliant 125 Varadero is a shining exception. Powered by the eager, durable, four-stroke V-twin from the 125 Shadow cruiser, the junior Varadero combines grown up proportions which suit larger learners, full-size looks and equipment with blissfully easy manners. In short, if you’re after an A1-compliant bike but one that looks and feels like a full-sized machine they don’t get much better. Sadly deleted in 2009 used examples remain in high demand with low mileage examples still available – so don’t expect a bargain. 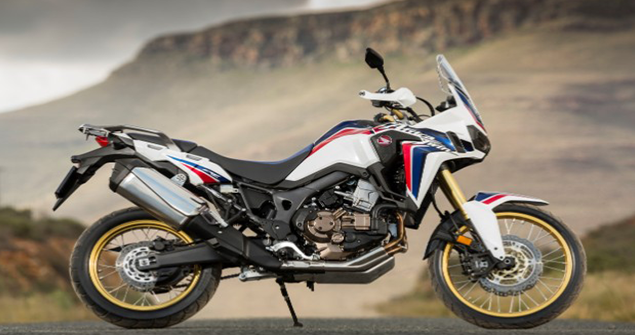 What you do get though is proper adventure style in a 125cc package combined with that typically brilliant Honda user-friendliness, quality and durability and the image that’s normally reserved for a far larger machine. The ‘smaller’ V-Strom has always been a brilliant, budget-orientated adventure bike and this latest XT version introduced in early 2017 is by far the best yet. Like its two predecessors the Strom uses the excellent 645cc V-twin from the SV650 in a more upright, roomy package. The first, angularly-styled version came out in 2004 before being thoroughly updated based on Gladius running gear in 2011. Early versions, however, weren’t the most durable while neither of the first two examples had a genuine off-road ability. That’s changed though with this XT version with its wire wheels, crash protection, updated styling and ergonomics and improved spec and performance. It now puts out 71bhp. In fact it’s so versatile and such good value you could make a case for it being the best new buy around but as an even cheaper low mileage used buy with improved build quality it’s a no-brainer. Kawasaki’s parallel twin rival to Suzuki’s V-twin SV650 and V-Strom 650 originally took the form of the ER6n/f road bike. 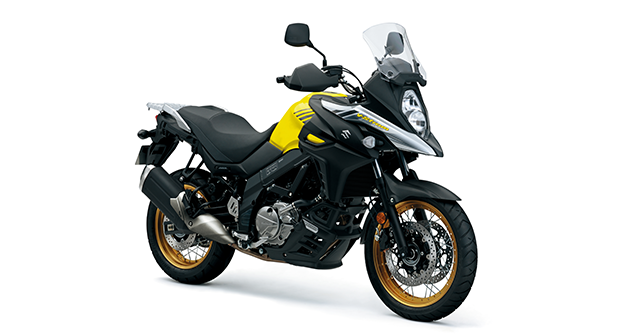 And from 2006 the Versys 650 adventure-styled variant was launched too. Like the Suzuki, the Versys has always been more ‘adventure style’ than true dual-purpose machine and it’s also taken the Kawasaki a little while to bloom. Though good, the first 60bhp version in 2006 was compromised by oddball looks and its successor in 2010 was still difficult to love despite improvements. In 2015 however, it finally came of age with power boosted to 68bhp slightly roomier proportions, new, fully-adjustable suspension plus adjustable screen and gear indicator. It may still be no off-roader but it more than makes up for that by being a great, truly versatile and great value roadster with engaging handling, lively performance and true distance appeal. Get a low-mileage 2015 example, perhaps loaded up with panniers, heated grips and the like, and it’s better yet. 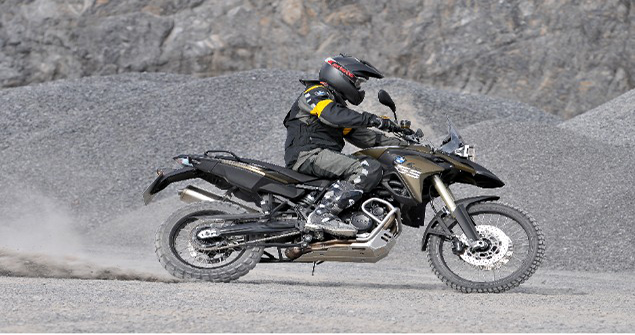 BMW’s first ‘middleweight’ twin cylinder adventure GS was hugely anticipated when first launched back in 2009. 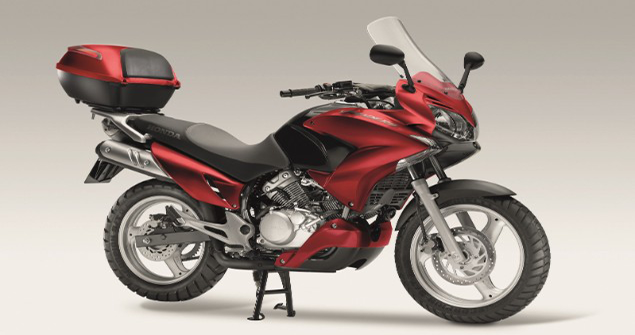 Based on F800 parallel twin running gear it convinced as a great all-rounder and true dual purpose bike, uninhibited by the bulk of its bigger 1200 brother. Unfortunately for BMW, though, it has failed to catch on in quite the same way, with Triumph’s Tiger proving far the more popular 800. But that’s good news for used buyers as used 800GSs can be far better value than the 1200 version. Look for one with full BMW dealer service history that’s been loaded up with all the usual BMW goodies (heated grips, ESA, luggage, tall screen) and not only do you get a great BMW adventure bike that’s even more versatile than it big brother, but also an affordable entry into BMW ownership with all the perks that brings. Seeming as something of an oddball mongrel when first launched back in 2010, the Tiger XCT was based on a bigger capacity version of the Street Triple’s 675cc three-cylinder motor. The Tiger 800 has since proved one of the British firm’s best and most popular bikes – and it’s not hard to see why. The bigger triple is both grunty, flexible and fun; its chassis is typically fine-handling; being larger and better protected the Tiger has more comfort and distance appeal. 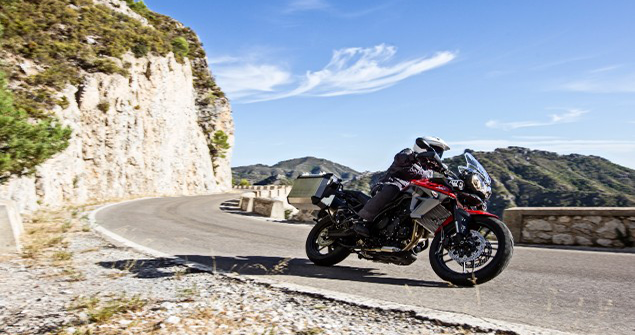 By coming in cheaper road (XR) and posher dirt (XC) variants and with a great range of Triumph accessories available you can tailor make exactly the kind of Tiger you want. Updated from 2015, it got rider modes, improved suspension and more. It has been updated again from 2018, which is better again – but also significantly more expensive. We’d go for a well-specced 2015 version and end up laughing all the way to the bank. 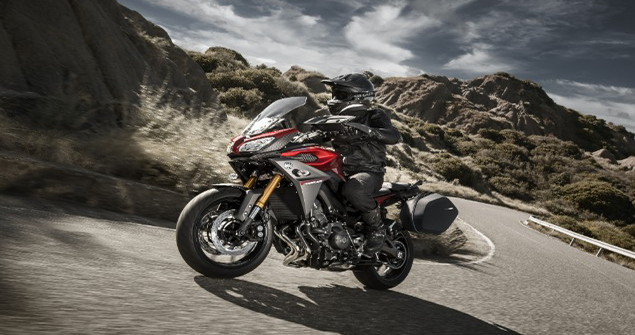 First introduced in 2015 as a variant of the already brilliant MT-09 roadster, the Tracer is what’s sometimes referred to as a tall-roader’. What that means is a pseudo adventure-styled bike with no genuine dual-purpose pretensions. Even so, the Tracer is a brilliant bike, with all the 115bhp zest and sprightly handling of the MT-09 but with roomier proportions, extra comfort, genuine two-up or long distance ability and all for a brilliant price. No wonder it has proved a Europe-wide best seller. Yes, the Tracer’s been improved again for 2018 with new bodywork, improved forks (the early ones are a little squishy), and there’s now also the option of a posher ‘GT’ version. But the original remains a great buy, especially at a little over six grand for a good one. An all-new Africa Twin had been a long time coming – the much-loved original 750 version went out of production back in the mid-‘90s – but it was certainly worth the wait. This all-new version takes a slightly different tack to many adventure bikes in being a genuinely credible off-roader thanks to its slimness, light weight and more. But it’s a better than average roadster, too, and glistens with typical Honda quality. The 2018-on, big-tanked Adventure Sports version may have even greater stature and appeal, but the standard bike has a lot going for it – especially if you want to do some off-roading. There’s even the slightly oddball, semi-automatic DCT version for those who want their adventure bikes to be ‘twist and go’. Austrian off-road giants KTM need no introduction when it comes to credible, big-bore adventure bikes. The original 2004 Adventure brought genuine off-road ability to the class, while the more recent 1050/1090 and 1190 versions are varyingly incredibly sophisticated and able. 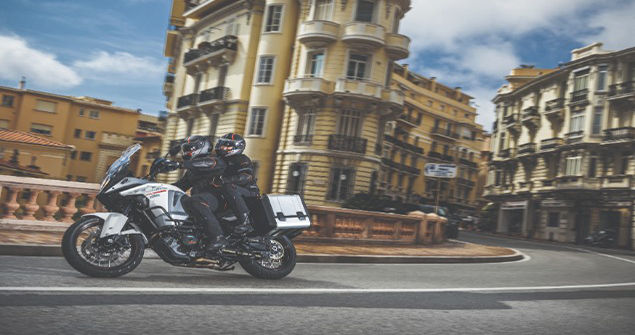 With 2015’s Super Adventure KTM took on BMW’s peerless GS Adventure with a 160mph, 30-litre tanked, ultra sophisticated wonder that pretty much had it all – speed, off-road ability, luxurious comfort and more. Unfortunately, it also had a £16K+ price tag and a dealer experience cosseted BMW buyers weren’t prepared to swap for so it proved unsuccessful and was dropped after only two years. As a used buy though, with prices starting at under £9K, they don’t come much better. Still the definitive, most popular big bore adventure bike of all. Seeing as BMW effectively introduced the category way back in 1980 with the original R80G/S and ever since have pretty much delivered the benchmark example of the breed, it’s with good reason. Yes, they’re everywhere and, yes, used prices are higher than most as well, but if you want unquestionably the best, this is surely it. Totally revamped in 2013 with an all-new 125bhp engine and bags of electronics it was face lifted and updated again in 2017. But in terms of a used buy, the earlier example, as long as in good nick, with plenty of desirable BM extras such as ESA, luggage and heated grips is the best value option. A fully-kitted, low-miler still demands big money, but more basic versions aren’t to be avoided and high-ish mileages shouldn’t put you off either. 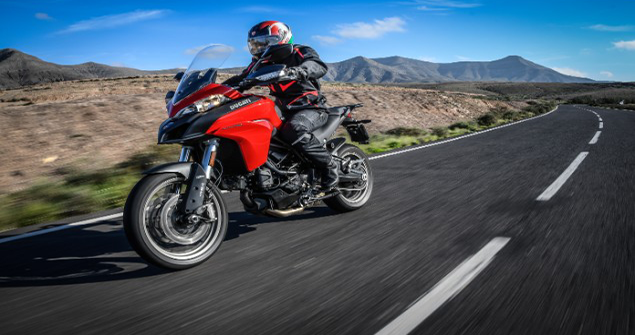 The Italian firm re-wrote the adventure bike rule book when it introduced the first 1200 Multistrada in 2010 complete with class leading rider modes and integrated electronic suspension (in S form). Along with the 150bhp V-twin engine the Ducati Multistrada brought unprecedented performance to the category. 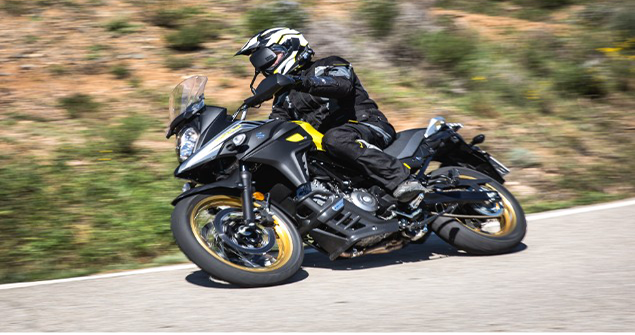 The same has been true ever since, through a series of updates to add ‘Skyhook’ suspension and, most recently, the boost to 1260cc. All, however, are fairly pricey and single-minded. The less heralded, cheaper 950cc version, introduced in 2017, changes both of those however. Its bigger front wheel gives it more off-road potential, the 939cc Hypermotard engine is lusty, and with 113bhp it’s fast enough for this class.